Who among us pilots and wannabes hasn't at one time or another tried to bring up some sort of ATC radio traffic on the web, only to be disappointed with the process? If you are like me, you have wanted to do this for training purposes but also just for its entertainment value. I have been intrigued with radio all of my life, ever since my father, Papa Louie, introduced me to the "Old Radio" in 1966 [read story here], which began my fascination with this interesting medium – one that magically transmitted sound through thin air. This old Zenith – which I still have and vow to restore one day – could pick up aviation bands, so by the time I began my primary pilot training in 1996, I had already learned a fair amount of the phraseology used by aviators. Dave Pascoe is the Founder of LiveATC.net and said to World of Flying this week: "I started LiveATC.net some time in 2003 - it was a collision of my hobby (Amateur Radio), my professional background in communications and network/internet engineering, and my flying activities (Private Instrument Pilot). Through my IFR training I became very interested in Air Traffic Control procedures and communications. I had access to a receive site near Boston so decided to put some spare scanners there so that I could listen to Boston Logan Airport - I used streaming audio technology to broadcast the audio over the Internet. I told a few people about the site and over time it got a following." "After a while, volunteers started contacting me and offering to stream their local airports through LiveATC.net. So over time I have built a network to support all of this - through a combination of my own software development efforts, help from some volunteers, and the goodwill of the many folks who provide feeds. And here we are today - a growing network of almost 300 airport areas, very good grade of service for listeners, and support for a growing number of mobile devices, including of course all popular desktop operating systems." As a Mac user like Pascoe, I find one aspect of LiveATC.net to be very good. On each available ATC frequency, there are several "Start" buttons for Windows Media Player and RealPlayer, but also for ITunes. See, when you live in a Mac world and when you want audio on your desktop, iTunes rules. 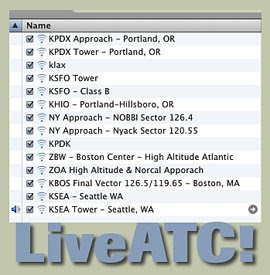 It is the one application that every Mac user uses every day, and now I have about 30 streaming ATC feeds available any time I want to follow the heavies inbound to JFK, or see what is going on at PDX as I flight plan a trip in Katy up to the Portland, Ore. area. In fact, as I write this, PDX Approach is on, and as an added bonus, the current METAR shows right in the iTunes window, how cool is that? If you have ever had any interest at all in monitoring online ATC transmissions, LiveATC.net is – in my humble opinion – the finest service of its kind on the web. Check it out here, and if you use it regularly, donations to keep it up and running can be made here.